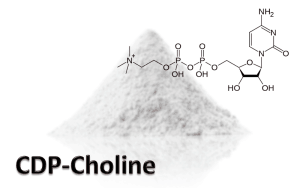 CDP choline, also known as citicoline, is a nutrient actually found in the body. It was originally isolated and then developed to treat stroke victims in Japan. Although it is a prescription drug in many countries throughout the world, it remains a dietary supplement in the US. Despite being well-studied and respected amongst certain circles, citicoline is not as well known in the general population. Citicoline is a compound that increases phospholipids through its conversion to choline and cytidine, which later converts to uridine, when digested. They consider it a prodrug, which means it is a compound that metabolizes into an active drug. Once you have digested citicoline and they have released, they quickly go to work. Choline is a nutrient that you can find in various foods, including chicken, kidney beans, and brown rice. It is the precursor to the neurotransmitter acetylcholine, which is an organic chemical that functions as a neuromodulator. Specifically, neurons release acetylcholine to alter brain structures process information and play a key role in focus, intelligence, motivation and arousal. Uridine is a nucleotide that makes up parts of nucleic acids. Foods that contain uridine include broccoli, tomatoes, and certain parts of meat. Our bodies use uridine to increase the synthesis of cellular membranes and to raise the production levels of phospholipids. Higher levels of phospholipids is thought to benefit synaptic functions and as a result, lead to improved rates of object recognition, short-term and spatial memory and concentration. Uridine is also thought to lessen the symptoms of Alzheimer’s disease and other neurological disorders such as bipolar disorder. The combination of the effects of choline and uridine are thought to increase the levels of a brain chemical called phosphatidylcholine, which is vital for brain function. In turn, this may have a strong influence on memory production and retention and even improve damaged parts of the brain. There are few known side effects of citicoline. Some people complain of nausea or a slight headache, but overall, citicoline is safe and effective to take. Normal doses range from 500 mg to 2000 mg daily and it is suggest to take citicoline for at least four to six weeks before fully experiencing its wondrous effects. We know that citicoline may be easy to purchase in many countries, although in a few places it remains an unregulated substance. Therefore it may be easier to purchase citicoline online. One by Jarrow Formulas has 120 capsules at 250 mg each and costs $38.00 (USD) before shipping. We also found a citicoline option from AOR offering 60 capsules at 250 mg each, also for $38.00. Healthy Origins offers a 150 capsule 250 mg each bottle, but for $86.00. Finally you can buy citicoline in powder form from Powder City, but it cost $16.85 (USD) for 10 grams. Citicoline is an effective brain supplement that is safe. They have scientifically researched and has a popular following. Since each person is different, it may take you a while before you begin to notice results. The science behind citicoline is certain exciting and it appears that since citicoline is able to cross the blood-brain barrier, it may just be able to provide you noticeable and effective results. While the price is a bit higher than we would have hoped, overall it seems like a pretty great supplement.